Samuel Eto’o has announced that he is retiring from international football barely a few days after he was left out of a new look Cameroon squad and replaced as captain ahead of two Africa Cup of Nations qualifiers in September. “I wish to inform you that I hereby put an end to my international career. On this occasion, I wish to thank all Africans in particular and all my fans to around for their love and support,” a statement on the player’s Official Facebook page said on Thursday. Samuel Eto’o has said his final goodbye to the Indomitable Lions? He was part of the team that won an Olympic Gold Medal in Sydney in 2000 and went on to win a second Africa Cup in a row (Cameroon’s fourth) in 2002. While he remains Cameroon’s all time best scorer at national team level, he continually faced criticism that despite his individual success (he is a four times African Player of the Year) and the trophies he won at club level in Europe (he won several Spanish league titles with FC Barcelona, two European Champions League trophies with the Catalan giants before adding a third with the Italian side Inter Milan) Cameroon stagnated at international level. He was often accused of fomenting trouble in the Cameroon dressing room, clashing with his team-mates, coaches and the country’s football authorities. Some suggested that he was the main protagonist in the row over World Cup participation premiums which led to Cameroon players refusing to board a flight to the World Cup in Brazil. 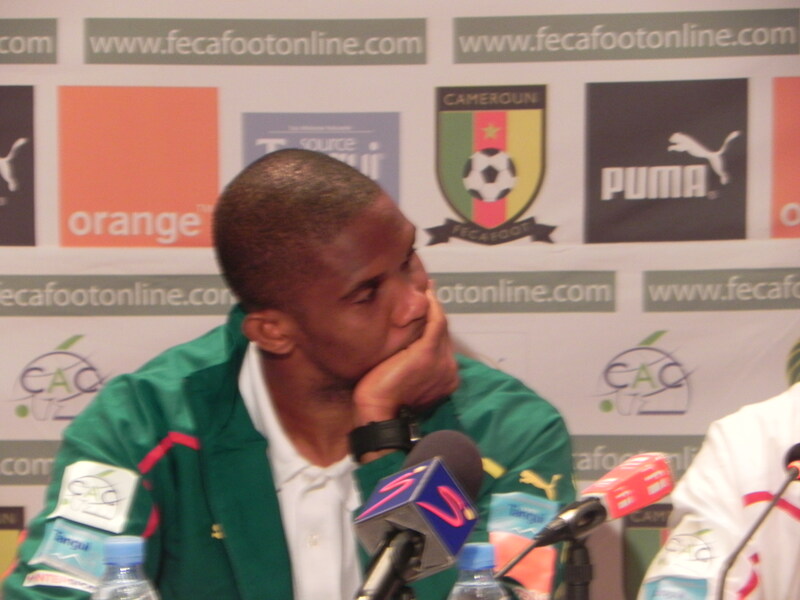 Although the Cameroon coach Volker Finke attributed his decision to leave Eto’o out of the squad to rejuvenation of the squad and also because the player had no club (at the time the squad was named), several Insiders felt the striker was paying the price for his role in that pre-World Cup farce and the disastrous campaign that followed. Eto’o had in the past been suspended from the team for leading a player strike in 2012 when the Lions refused to play a friendly against Algeria over a row related to participation premiums. Notwithstanding his rumored negative spots, Eto’o remained a real talisman for the Cameroon team and possibly the country’s most talented player at the moment. He will be missed by Cameroon, not for the goals he scored but more for his playmaking ability which were more apparent when he played for the national side. In fact, he was rarely used as a central striker by most coaches from 2004, often deployed to the left or right of a three-man attack or as a playmaker behind the main striker. It is the second time that Eto’o looks set to abandon the national colors. The difference this time though is that he made a formal announcement which wasn’t the case in late 2013 when it was rumored that he quit the selection. He will be replaced as national team captain by Stephane Mbia who was appointed by the Cameroon minister for sport on Monday. Eric Choupo-Moting and Vincent Aboubakar were named vice-captains. Meanwhile, veteran Cameroon midfielder Jean Makoun has also announced his retirement from international football. He had also been left out of the squad as Cameroon tries to rebuild after two humiliating World Cup participations in 2010 and 2014 and failing to qualify for the last two Africa. Cup of Nations tournaments. Cameroon’s national soccer team captain Samuel Eto’o has not been selected for the country’s Africa Cup of Nations (AFCON) 2015 qualifiers against the Democratic Republic of Congo (DRC) and Côte d’Ivoire next month. Eto’o is among 13 players who have not been called up after Cameroon’s disastrous 2014 World Cup showing in Brazil where the team lost all three group games and finished 32nd out of 32 teams. Goalkeeper Charles Itandje, the left back Benoit Assou-Ekotto who head butted a team-mate during the team’s 4-0 defeat to Croatia, striker Achilles Webo and veteran midfielder Jean Makoun were also not included in the list of 25 players called to camp by head coach Volker Finke. Alexander Song who is serving a three match ban for striking and opponent in the back during the game against Croatia is also absent. Finke’s list includes several young players, some of whom have not played any first team football with their European clubs. The youngsters include forward Jean Marie Dongou, defender Frank Bagnack and goalkeeper who play for FC Barcelona’s B team. The German-born trainer has recalled goalkeeper Ndy Assembe (Nancy, France), left back Gaetan Mbong (Olympiakos, Greece), and midfielder Cedric Loe who were left out of the World Cup squad. There’s no space for Guy Armel Kana-Biyick who announced his international retirement after he was not picked for the Brazil expedition. Here’s the full list as published on the website of the Cameroon Football Federation (Fecafoot).